Choose from wall mounted or freestanding, LPG gas or electric; outdoor heat can be supplied at the touch of a button, or the flick of a switch. The range of designs is diverse but as a group they tend to be sleek and contemporary, predominantly manufactured from high grade steel. 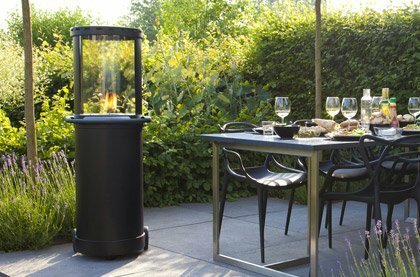 Choose from LPG bottled gas or electric, our selection of patio heaters will keep you in your garden long after the sun sets. Many of our gas patio heaters have a directional heat focus lamp head allowing you to focus the heat to a specific area or leave it flat to spread the heat evenly over a larger area. 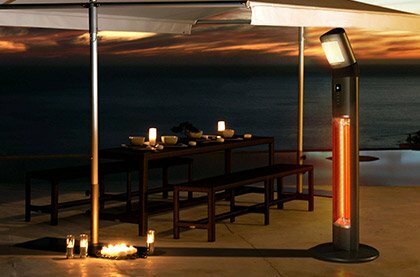 Patio heaters allow you to make the most of your outdoor space, entertain guests long after the sun has set and the temperature has begun to drop, simply switch on the heater and keep the conversation flowing. 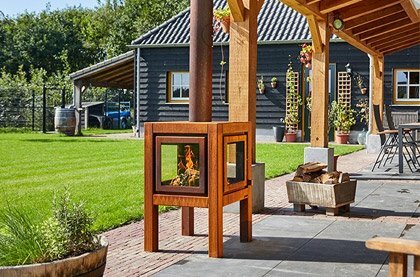 These brilliant heaters will revolutionise your social life, and put you more in touch with the great outdoors, even if in this case the great outdoors is really your garden, it's still better than being stuck inside! If the selection is too broad for your needs or requirements, try using our filters to narrow your search criteria at the side of this page, so you can easily find the product that’s right for you.